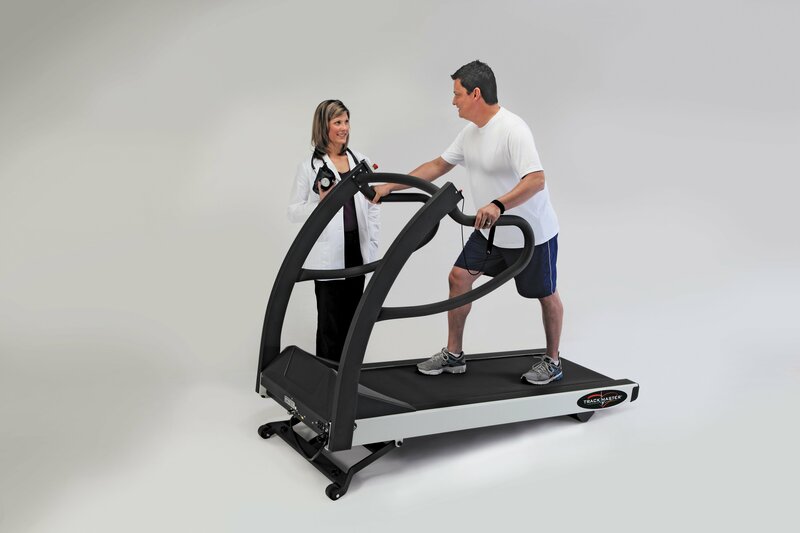 The Trackmaster® TMX428 heavyduty, medical treadmill is speciﬁcally designed to be interfaced with and controlled by a wide variety of Cardiac and Pulmonary Stress Testing Systems. Made in America since 1983, Trackmaster ® is manufactured under a Quality Management System registered to ISO 13485 and complies with worldwide regulatory requirements. Tens of thousands are in daily use. 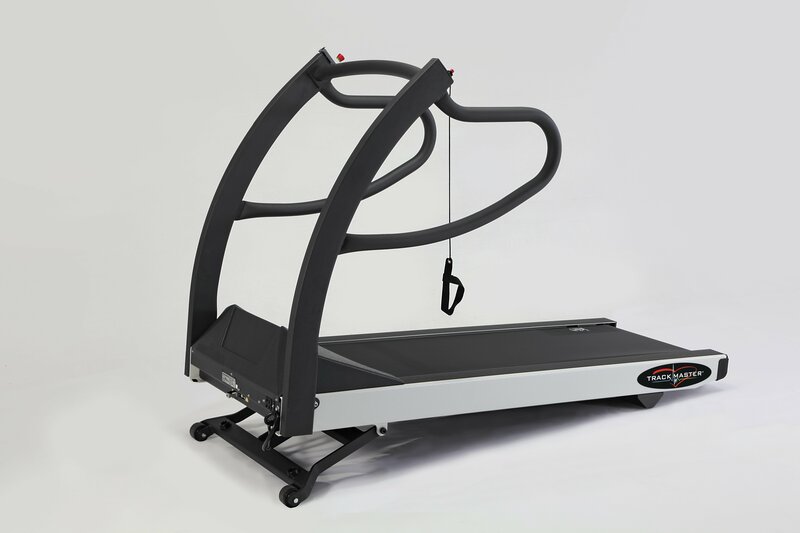 The easy to locate and easy to use emergency stop button can be installed on left or right treadmill handrails. For additional safety, a tether worn on the patient’s wrist stops the treadmill when pulled. Patented MasterTrack ® Belt Alignment System Trackmaster’s 22″ (56 cm) running belt is the widest in the industry, which provides conﬁdence to the user. MasterTrack ® is a patented v-guide on the underside of the running belt, which matches grooves in the running deck and rollers. 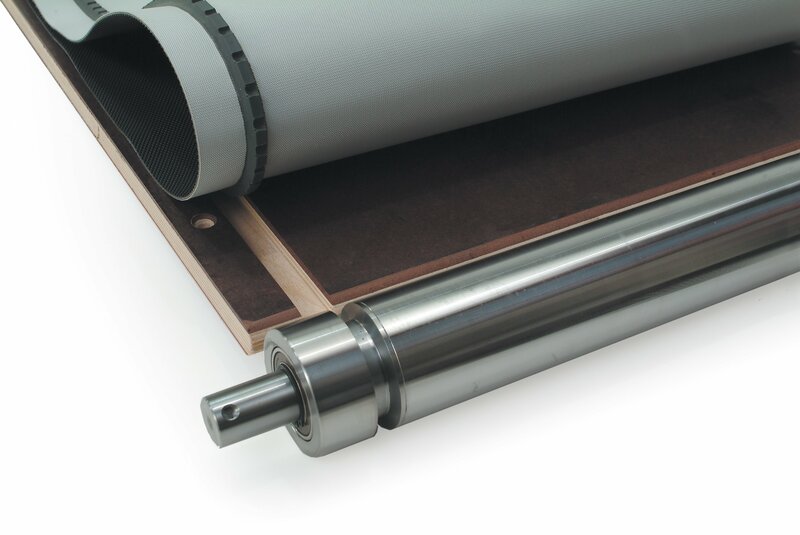 This prevents any lateral movement of the belt and eliminates belt alignment issues. In addition, the deck is mounted on shock absorbing isolators to minimize impact stress. Smooth, quiet, zero-start, 4 HP (6 HP peak) hi-torque drive. Low-to-the ﬂoor, cushioned deck for patient comfort and safety. 22″x 63” (56 cm x 160 cm) running belt and safety handrails. Patented MasterTrack ® belt alignment system eliminates off-center running belts. Exceptionally accurate, selfcalibrating speed and elevation. Prominent emergency stop button and patient safety tether. The TMX428CP can be operated in diagnostic mode (interfaced with a stress computer) or non-interfaced, independent mode. When the interface is active, only the emergency stop buttons on the controller are enabled. Once the computer program is closed, the controller reverts to full functionality. The controller can be operated manually and also has 5 preprogrammed stress protocols (Bruce, Gerkin, Naughton, Balke- M, Balke-F) and 5 preprogrammed ﬁtness workouts. Additionally, there are 5 user deﬁned, custom programs with 10 stages each. In manual mode, the large, bright display shows Speed, Pace, Elapsed Time, Elevation, Distance, Calories, METS, Heart Rate and Target Heart Rate (user deﬁned). Calculations are determined by ACSM formulas based on user weight, age and gender. In pre-programmed or user programmable mode, the display will prompt the user to enter required data and will graphically display progress in the mode selected. If ﬁtness or user deﬁned modes are selected, elevation and speed can be adjusted when in use; the stress protocols cannot be adjusted.